When the time comes to remodel your home, one choice you will probably be making is which countertop material best suits your needs and personal tastes. While there are many to choose from, engineered stone is becoming more popular because of its wide range of colors and overall durability. Before you decide whether this countertop style is right for you, there are a few facts you might want to consider first. If you have a large family or enjoy cooking daily, then these countertops may be a good choice because they are resistant to stains. Unlike porous selections, spills remain on the surface of the material instead of sinking into it. This makes cleanup and maintenance simpler. If your old countertops were marred by scuffs and scratches left behind by food preparation, you will likely appreciate the durability of this stone. If you are having more than one area of your home remodeled, then consider asking your installation technicians about using engineered stone countertops in your kitchen and bathroom. The quartz construction makes these counters resistant to many different types of stains, including stubborn soap scum and hard water marks. Depending on the design of your current bathroom counters, your home improvement professionals may be able to install your new countertops over the old ones to complete the transformation quicker. It is wise to discuss your remodeling budget with a contractor before you commit to engineered quartz or marble countertops. While their construction makes them long lasting and able to withstand heat and stains, they can be costlier than other options. However, the expense may be worth it because they require so little maintenance once they are installed. 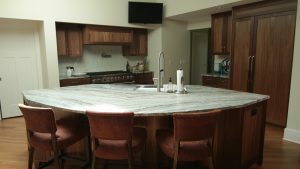 Engineered stone countertops are a popular remodeling choice for many homeowners. Knowing the facts about their construction and features can help you make the most informed decision possible regarding your next home improvement investment.